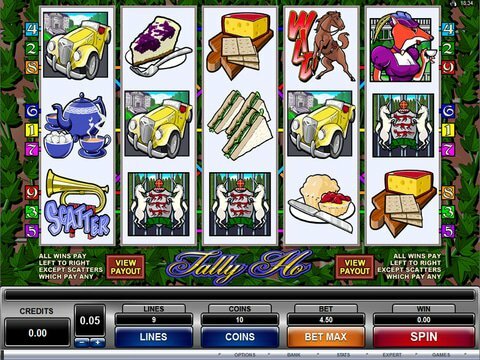 The Tally Ho slot machine from Microgaming offers up five reels and nine paylines filled with well-to-do foxes living in mansions and driving fancy cars. It's definitely silly, but since you can review it right here on this page with no download and no registration thanks to the Tally Ho free play slot demo that is available here, you can decide for yourself whether or not it's worth your money. Whether you're at home or on the go, you can try it out from your favorite computer or mobile device anywhere in Canada as long as you have an internet connection. Getting started is as simple as choosing your per-spin bet amount, and this ranges from a penny up to $90. The top jackpot here is a nice $60,000 if you've chosen to bet the largest coin, too. What's more, there are a few interesting features that help to make this game fun, and they all start with the Stallion wilds which fill in for other symbols to create wins and double their values all at the same time. There's also the Bugle which is a scatter that can give you 10 free spins if you see three or more on your screen, but two or more will also net you an instant win. There isn't a second-screen bonus game, but there is a gamble feature that can help you boost your bankroll if you use it wisely. There aren't a lot of games out there with unique themes like this, but another title that is based on the life of luxury that you surely won't want to miss - especially if you're in the mood to play for real money - is Mega Fortune from Net Entertainment. It's all about the rich big city life, and the big wheel of prizes is where you'll earn the dough. Features like plentiful wilds, free spins, the second-screen bonus round, and access to a progressive jackpot make this game worth your time.